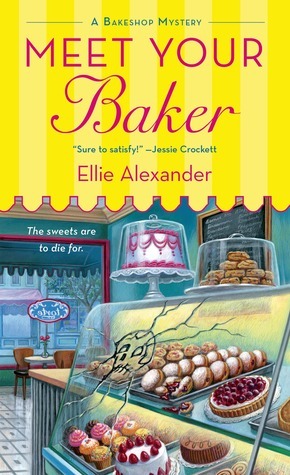 The third book in Ellie Alexander’s Bakeshop Mystery series takes readers out of Torte, Jules’ family bake shop in the small town of Ashland, Oregon, to a secluded woodland resort known as Lake of the Woods. Julies and Sterling, one of her staff at Torte, head to the resort to cater a weekend retreat for the board of Ashland’s Oregon Shakespeare Festival. But among the weekend’s guests are a surly bartender, a grumpy mechanic, an exhausted owner, Jules’ estranged husband, and a murderer. Soon the entire group is snowbound, cut off from any outside assistance, and fighting to keep the generator humming. 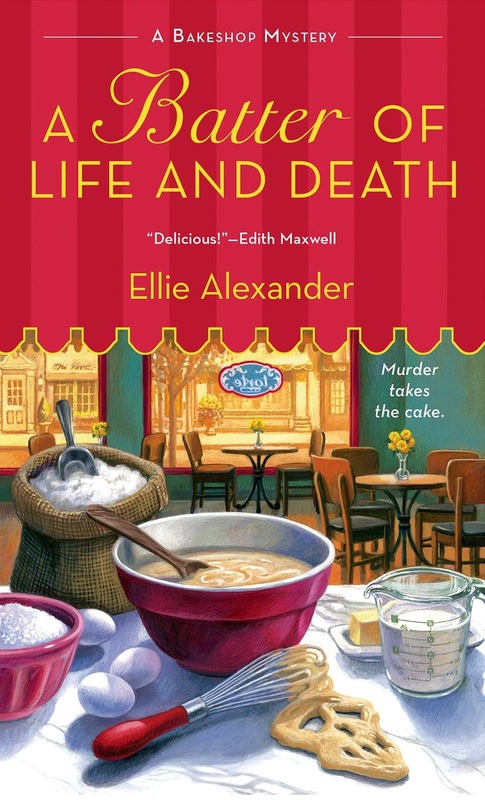 All Jules wants to do is cook and bake, but this catering job has put her in the path of a killer and in the middle of a love triangle. 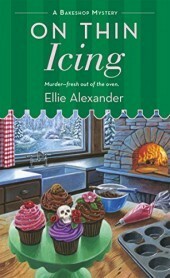 Ellie Alexander never fails to entertain and ensnare my imagination . . . not to mention entice my appetite! Jules is always cooking (or baking) something that has my mouth watering. This is one of my very favorite series and one of my very favorite authors. I’m a steadfast member of Team Thomas and I can’t wait for Jules to figure out that he’s the guy for her! What a great way to start off a new year of reading! They say that you can’t go home again. I’m not sure that’s true. I’d been home for almost six months, and found myself settling back into a comfortable and familiar pace. Working at our family bakeshop, Torte, had helped ease the sting of leaving my husband and the life I’d known behind. I didn’t have any answers about what was next for Carlos and me, and the longer I was home the less it seemed to matter. Ashland, Oregon, my welcoming hometown, was the perfect place to mend. Being surrounded by longtime friends and family for the past few months had made me realize that while my heart may have been a bit broken, I wasn’t. It was an important distinction, and hopefully a sign that I’d made the right decision. I’d been so consumed with baking and growing our catering business at Torte that I hadn’t had much time to reflect. Ashland is best known for the Oregon Shakespeare Festival. The world famous theater company draws in thousands of visitors each year. From February through October our sleepy town transforms into a tourist hub. Theater enthusiasts, families, school groups, and travelers from every corner of the globe descend on our quaint streets. The steady stream of visitors was great for business. During the height of the theater season it was nearly impossible to get a table at Torte, or any other restaurant in town. Shopkeepers make their yearly profits in the busy summer months. Torte had a booming summer and fall season, so much so that my only focus had been on the bakeshop. Now that winter had closed in and OSF had closed its doors for the season, it was as if the entire town shuttered in as well. I’d forgotten how quiet Ashland becomes in January—and how cold! After spending ten years working as a pastry chef for a cruise line, I hadn’t experienced a winter like this in a long time. My winters had been spent island hopping in the Caribbean and sailing in the Mediterranean, where the sun sparkled on warm waters despite the fact that the calendar read January. January in Ashland was a different story. The temperature had been dropping steadily since October. Fall’s cool crisp mornings felt practically balmy compared to icy layer of frost that coated the ground. I’d invested in a new collection of sweaters and wool socks. Despite pulling on heavy layers before leaving my apartment, I still shivered on my short walk to Torte. Torte is located in the heart of downtown. The bakeshop sits in the middle of the plaza, nestled between shops and restaurants and with a front-row view of the bubbling Lithia fountains across the street. It’s a prime location for grabbing a pre-theater snack or a catching up on the latest gossip. Helen, my mom, had been running the bustling bakery solo since my dad died and I took off to see the world. Her delectable handcrafted pastries are legendary with locals and anyone passing through town. Not only do people find comfort in her sweet creations, they also seek her out for advice and her kind listening ear. Everyone who walks through Torte’s front door is treated like family. That’s the secret to Torte’s longevity. Well that, and the binder of recipes passed down through generations of my family that mom keeps locked in the office. Keeping baker’s hours means that I’m always awake long before anyone else. This morning as I hurried through a biting wind to Torte, the streets felt especially dark and gloomy. I quickly unlocked the front door, flipped on the lights, and cranked on the heat. A large chalkboard on the far wall displayed a Shakespearean quote reading: In winter with warm tears I will melt the snow, and keep eternal spring-time on thy face. My dad started the tradition of a revolving quote when I was a kid. He loved everything Shakespearean, hence why he insisted on naming me Juliet. I prefer Jules. There’s way too much pressure attached to having a name like Juliet. But each time I glanced at the chalkboard, I smiled at the memory of my dad’s sparkling eyes and quick wit. Torte’s front windows had frosted overnight. I rubbed my hands together for friction and made my way to the kitchen. The bakeshop is divided into two sections. Customers can nosh on a pastry or linger over an espresso at one of the tables or booths in the front. A long counter and coffee bar separates the dining space from the kitchen. It gives the bakery an open feel and allows guests to watch all of the action in the back. I grabbed an apron from the rack and tied it around my waist. Our red aprons with blue stitching and a chocolate Torte logo in the center, are as close as it gets to a uniform around here. Everyone on staff wears one of the crisp aprons that match Torte’s teal and cranberry colored walls. My first task of the day was getting the oven up to temp. We’d been down an oven for a while. Managing with one oven was doable during the slow season, but Mom and I had been tucking cash away in hopes of upgrading our equipment before things got busy again. 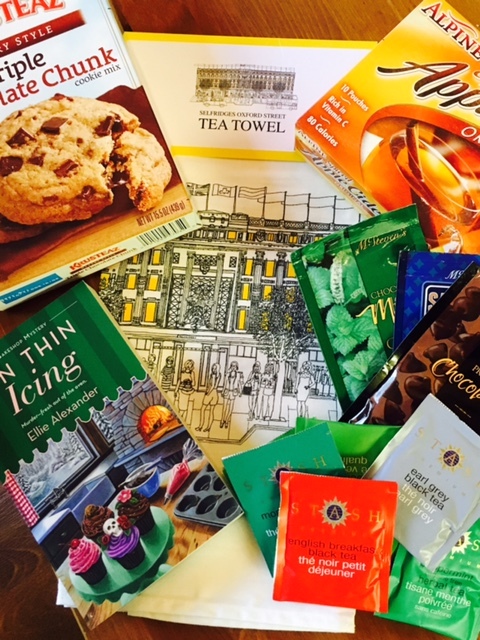 I turned the oven on high, and leafed through the stack of special orders waiting on the kitchen island. On today’s agenda were two birthday cakes, a pastry order for the theater, and our normal bread deliveries. The tightknit business community in Ashland diligently supported and promoted each other, especially in the off-season. Wholesaling our bread to local restaurants and shops definitely helped with cash flow. I washed my hands with honey lavender soap and got to work on the bread. There’s something so therapeutic about the bread making process. From watching the yeast rise to kneading the dough, I allowed my thoughts to wander as I went through the familiar steps. Some of my colleagues in culinary school complained when they had to work early shifts. I remember one aspiring chef said that she always felt lonely in an empty kitchen. Not me. I like working in a quiet space with nothing more than the hum of a mixer and the scent of sourdough bread baking around me. That’s not to say that I don’t enjoy a vibrant kitchen with bodies squeezing past each other and a counter chocked full of delectable treats. I guess, like so many things in life, it was finding the balance between solicitude and socialization that counted. This series is a lot of fun, I’m glad you’re enjoying it too! Thank you so much for hosting a tour stop and sharing your thoughts! It’s definitely one of my favorite series!